CNN Political Contributor offered some thoughtful commentary on Monday. 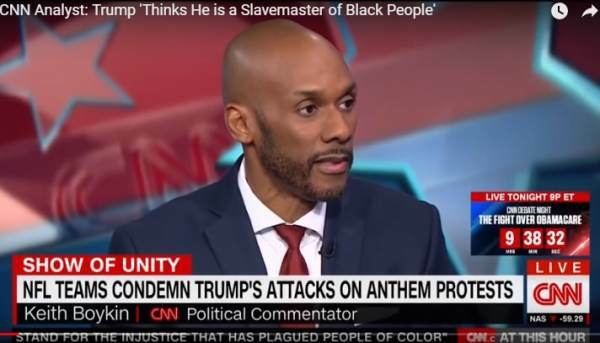 Keith Boykin called President Trump a white supremacist in the White House because he supports standing for the national anthem. Yeah, that’s totally reasonable and unbiased analysis. Keith Boykin: We have a white supremacist as the President of the United States. He’s encouraging white supremacy, and the fact is… He’s playing the plantation politics. He thinks apparently that he is a slave master of black people in the NFL, of black people in the country.